Since 2008, InterCoastal Net Designs has partnered with Carolina Plantations to achieve top search engine results and an impressive web presence. This past spring, the client decided it was time for a redesign of the website and we launched the new look on August 1st. 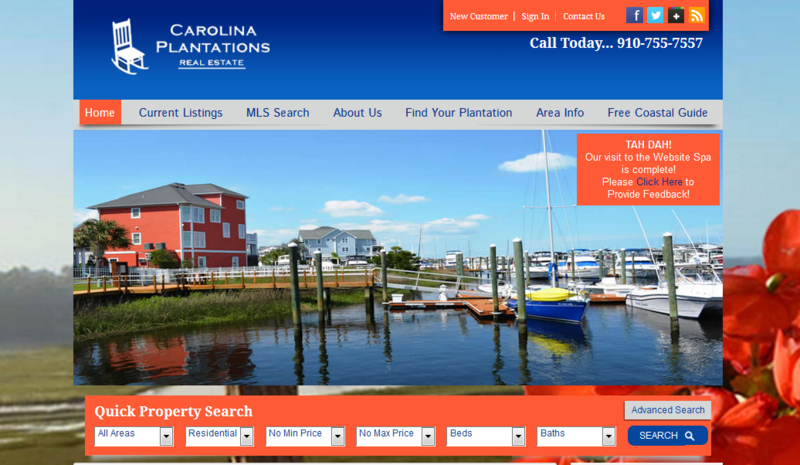 We believe this website better reflects the entire brand image of Carolina Plantations Real Estate. Carolina Plantations has also participated in our SEO services for five years and the site ranks well for the area’s top neighborhood search phrases. This client is a great example of the benefits of SEO and how participating in SEO for a long period of time produces impressive results. The new website boosts our MLS 3d and responsive design. Since it’s launch on Aug. 1, the website is producing results and successfully collecting leads. Thanks Carolina Plantations for your dedication to not only online marketing but to the InterCoastal Net Designs’ team.